I want to take a moment to review two important topics: exponential growth and compounding interest. Understanding these two topics, which are something you probably heard many times throughout your boring educational years, is incredibly important to understanding how our future may play out. The charts in this discussion all follow this formula and there are two videos at the end that review both. The entire face and structure of our global economy changed in 2008 when the engine of global credit growth, the United States, stopped growing during the financial crisis. For those that want to learn more about the different layers of credit that make up "total credit" and how the markets got to this point today, I recommend reading Richard Duncan's The New Depression, which is the best book on finance and economics released this year. The red line in the following chart, created by Chris Martensen, shows total credit market (total debt) growth in the United States from 1970 to today. 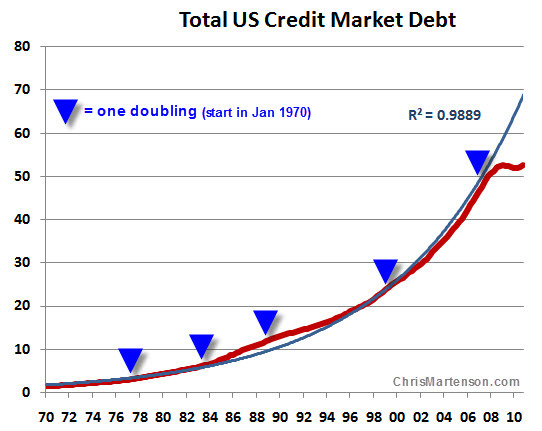 Each arrow along the chart shows the point where the credit market doubled in size. The growth of credit from $1 trillion in 1970 to over $50 trillion in 2008 created the greatest boom in the history of the world. The problem, which we have found out recently, is that credit at some point must be paid back. If it cannot be paid back then there are severe dislocations in the interconnected banking system we are surrounded by today. If this credit was not able to continue growing, or even worse continued to contract, the United States economy would have moved immediately into a (visible) depression beyond what it has already experienced over the past four years. It is similar to a patient who has been hooked to life support for so long (debt growth) that if the life support were to be removed they would immediately enter cardiac arrest. Because this process took place over a 40 year period and the compounding of credit grew slowly year after year it was not easy to see that America had become a junkie relying on the next fix in order to survive. This has clearly helped the real estate market as homeowners that were not underwater were able to refinance at a much lower interest rate as their adjustable rate loans were coming due. The commercial real estate market has been helped as well with cap rates falling and loan refinancing possible for loans above water. The rest have been extended and pretended for an unknown period of time. 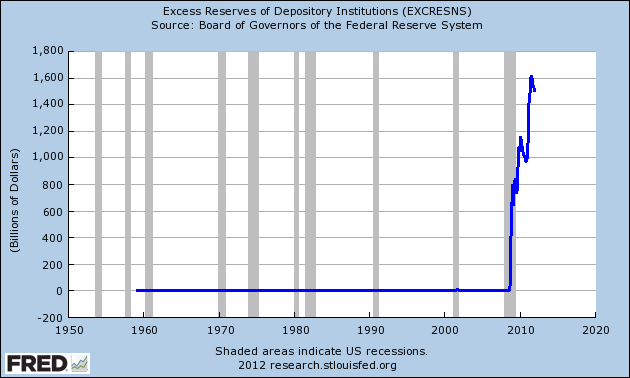 The following chart shows the growth in reserves at the largest banks. The "hockey stick" formation shows that through quantitative easing banks have swapped credit instruments (mortgages & treasury bonds) for cash. This cash has been building on their balance sheet for close to four years, and will continue to do so until banks feel they have enough capital reserves to cover their shadow banking losses. When this will occur, meaning when banks will lend, is unknown as most of their real estate loans are marked to "myth." The government has stepped in as the lender of first and last resort when the consumer and banking sector credit growth collapsed in 2008. 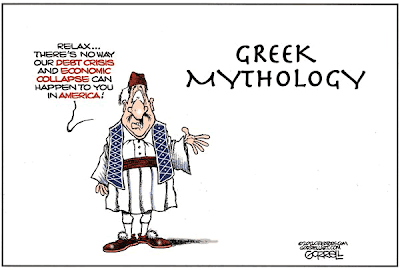 They have brought stimulus programs, funded all student loans, and they have become the housing mortgage market. During this period of staggering debt growth interest rates on treasury bonds have fallen month over month and are now sitting at all time record low levels. For much more on this topic see Long Term Government Bonds: The Largest Bubble & Mania In History. 4. Boost the stock market to create the "wealth effect"
The Fed has been surprisingly open over the past four years on how important they view the value of the stock market. Bernanke even penned an op-ed in a major newspaper publication taking credit for the rise in the stock market and how it helped the recovery. I certainly do not disagree with him. America is a consumer first society. If people feel wealthier, which is impacted directly by their stock market statements every month, they are more likely to spend and this spending will boost the economy. All four of these objectives have been achieved. The final goal, which is to have banks active again in the lending markets, has not yet been achieved. At this point the government is still the first and only credit growth machine in the economy. This strategy of QE/government spending has worked thus far to keep the economy growing (at an extremely sluggish rate - but still growing). So what is the problem? Can we not just implement this QE/government spending growth forever? It seems like free money, or a free lunch as some would say. 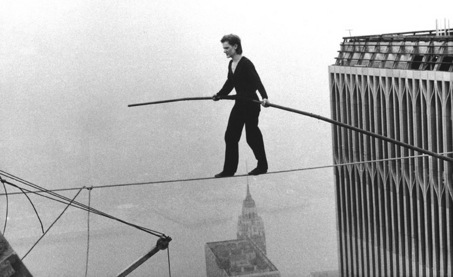 So far Bernanke and the United States government have walked a perfect tight rope making their actions appear harmless. Imagine someone that drinks alcohol all day during work at the office and then drives home at 100 mph on the highway. If nothing goes wrong then it appears that their actions are harmless, and actually benefiting their life (has more fun at work and gets home faster at night to family). An intelligent person would understand that it is only a matter of time before an event occurs that impacts their ability to live this way. The event coming for the United States will unfold in one of two ways (or both could occur simultaneously). 1. 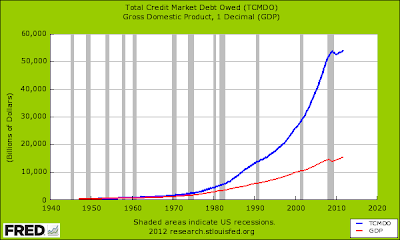 The size of the economy does not grow fast enough to keep up with the payment of the credit market (debt growth). This means in simple terms that there is not enough income to support the debt. Let's begin with the first issue. 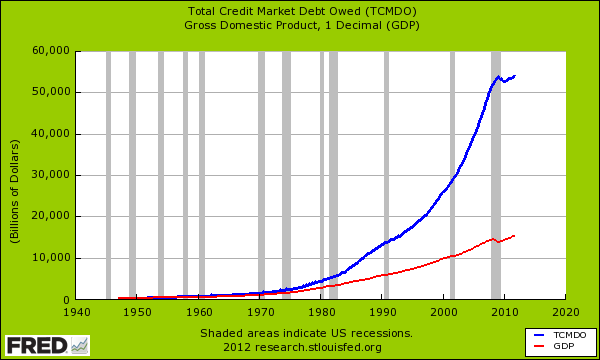 This can be seen visually in the following chart showing total credit market debt (blue line) vs. the size of the American economy (red line). The United States has financed its $16 trillion in government debt through one large adjustable rate loan. What would happen if interest rates were to rise off their record low levels and this loan were to "adjust?" The payments on interest alone would overwhelm the government's ability to pay. This would create a vicious cycle where investors would sell more bonds and interest rates would rise further, compounding the problem. 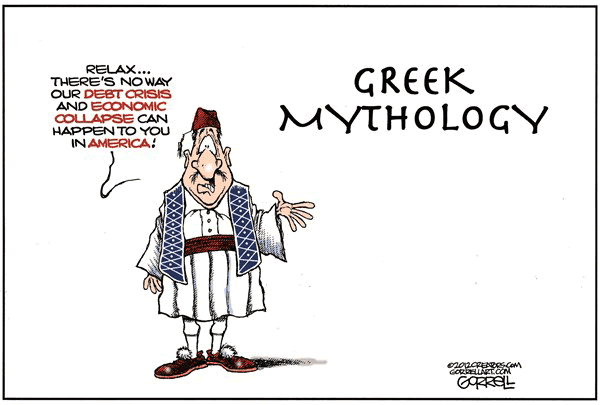 This is exactly how it played out in Greece and how it is currently playing out in Spain and Italy. This is coming to the United States. It is not a matter of if, it is a matter of when. The second issue with the current QE/government spending solution to our economic growth is that at some point the reserves on the bank's balance sheets are going to begin to enter the real economy in the form of new loans. This has the potential to flood the economy with a growth in the money supply as banks are limited only to capital reserves to create new loans. The reason this has not happened yet is because banks do not yet feel comfortably lending into the market due to their own balance sheet impairments as well as the quality of the borrowers and assets they are borrowing against. In other words, banks are not stupid. They know they should not be lending to an American at 3% interest with 3.5% down on a home that is overvalued. They will let the government (tax payers) do this until either home prices fall to correct levels. 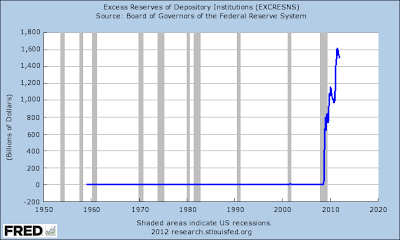 In the meantime, they collect .25% interest on the free money given to them and stored at the Federal Reserve. And the next video provides a follow up to the power of compounding interest. David Stockman On The Endgame: "We're There"
For anyone that out there that has still not seen this movie, which is the best documentary released on the financial crisis. It is narrated by Matt Damon and a great Sunday afternoon watch.